The bottom line of the latter article is that Subsidies for Renewables Increased 186 Percent (186%) since 2007. And although wind cost more actual DOLLARS, as a cost per megawatt hour, solar yield the least bang for the buck. It is important to note that TOTAL ENERGY SUBSIDIES in 2007 were $17.9 Billion. In 2010 were $37.2 Billion. That is a 108% increase. Over just 3 years. 77% of that increase came from the Obama Stimulus. So let’s boil this down even more. Forty percent (40%) of the $37 Billion we give in subsidies generate less than 5% of all US Electrical Power. And we are spending 2 times the amount on renewable power than the industries that create 95% of our power. 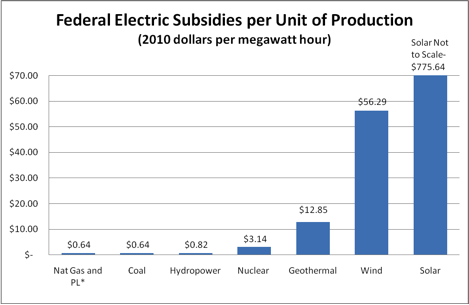 So since SOLAR is creating LESS THAN 1% of all US Electricity and using 3% of all subsidies. THIS IS A TOTAL FRAUD RIGHT? Maybe. Maybe Not. Let me give you the other side. Each $5.9 Billion spent in subsidies replaced 1% of energy production. Theoretically had the stimulus been spent ALL on renewable energy – we would have increased our energy output 132%. If that were to happen, energy prices around the world would drop and chocolate lollipops would fall from the sky. Of course it doesn’t work that way. In reality, it takes 2 to 4 years for these investments in power facilities to pay off. In reality, the increased energy output we saw through last year HAD NOTHING TO DO WITH OBAMA OR THE STIMULUS! The kicker is 77% of the INCREASE from 2007 until 2010 came from JUST the Stimulus. We really won’t know for another year or two exactly HOW beneficial all that “green” energy money Obama spent will benefit. With catastrophe’s like Solyndra we can guess that it won’t be AS efficient as what previous administrations achieved – BUT REMEMBER THE DEPARTMENT OF ENERGY DID NOT WANT TO APPROVE SOLYNDRA! It should give us SOME comfort that there were people in government who did NOT want to waste money. They aren’t all crooks. Some really are looking out for the tax payer. Remember, green/clean is my day job. Rush may be right on a lot – but he is seriously misleading the country by saying “solar doesn’t work.” The solar world isn’t just a bunch of scientists trying to make this work. JP Morgan, Goldman Sachs and the oil companies invest BILLIONS in this area and they ARENT incentivized to throw away money. So where is the pay off? Non-hydro renewable energy increased 60% since 2007. This increase completely made up for the loss in other energy areas allowing us to maintain our overall energy output which would have otherwise fallen and increased prices. Over 100,000 people are employed in the solar industry and it is creating jobs 7 times faster than the rest of America. The solar industry alone EXPORTED $2 Billion of solar products and services last year (2010). First, let me say – you express yourself rather well. But here are some facts you need to know from someone who works IN the industry. It is true that the entry costs to create solar power would not likely happen without government incentives. The cost to build and deploy a solar field is much more expensive than drilling a well to get natural gas and send it to the refinery. Even though solar can keep collecting and sending electricity to the grid with cheaper operational costs LONG after a gas field or coal mine is tapped out, the depreciation of the initial costs still make it cheaper to find and use other energy. Solar installations DO make money. They just (normally) take longer to do it. And while an energy investor would find a BIGGER and QUICKER return by investing in coal, gas or oil, there is still a profit to be made in solar and other renewables. There are some solar technologies that nearly compete, head to head, with conventional energy. Thin film and concentrated solar thermal are getting very, very close. Also, as we often do, US prowess and inventiveness has made a very large impact on the world wide solar industry. It is one reason although the Chinese may manufacture solar panels at one eighth the cost we can – it is US technology that is actually making many of the quantum leaps reducing both implementation and operational costs. But, does the GOVERNMENT have any business in this...business? A "break" reducing or eliminating taxes that would otherwise be collected by a PROFITABLE enterprise? This term “subsidy” is thrown around loosely by everyone from environmentalist wacko's to conservative tax groups that pinch a nickel so hard they George Washington a headache. * And they all don’t mean the same. Many of the far left Global Warming crowd claim that oil subsidies, by themselves, are nearly equal to the what our own Department of Energy claims are ALL “subsidies.” You’ll see why below. Should we value “clean” energy as more important that fossil fuel energy? With the global warming scam debunked, (here and here), why would we consider an energy created at $30 a unit more important one created at $3? Energy is energy right? I will make the “Bruce Willis” exception for this. If there is an asteroid heading for earth that will annihilate the US, we would find that a useful and constitutional use of our money. National defense. In fact, in this case – you might as well just borrow it from the Social Security trust fund as you’ve been doing, because if Bruce and Ben don’t stop it – they aren’t going to be needing that or those Medicare benefits anyway. (I know. Mean, cruel conservative joke. Lighten up Francis.) The point is there is no NATIONAL interest in which type and deliverer of energy especially when there are plenty of untapped resources still …untapped. ONGOING SUBSIDIES – Contrary to the weak defense of Solyndra by the solar industry head “Rhone Resch,” the Solyndra business plan was turned down on it’s economic merit in the Bush White House for a reason. They would NEVER be able to generate solar panels cost effectively against the Chinese and Indians. (What idiot PR person told him to DEFEND Solyndra?) Anyway, a business that can’t make a profit without government support isn’t a business. It’s a lobby. Kerosene wiped out the sperm whale oil business because it was 7 times cheaper. Not because it didn’t Kill “Free Willy.” When Colonel Edwin Drake discovered oil in Titusville, Pennsylvania, he didn’t do so because of a government grant. And the towns and industries (including Standard Oil and Rockefeller) didn’t NEED an incentive other than the normal course of free market capitalism and it’s promised benefits. So it is strange to find out that EVERY energy industry in the United States, has at some time or an other, benefited from government subsidies. Many of these have been beneficial including our research funding in the 1950’s for nuclear energy to our funding of strategic reserves in response to the Middle East oil crises two decades later. It may seem off subject but stick with me. I love women and I love basketball. I do not love women playing basketball. For this I would need a subsidy. But give me a chance to see MVP DRose serve up a facial on LeBomb in Miami? Pay per view wouldn’t be out of consideration. Real life shows us how this works. The minute Howard David Stern talked about cutting an NBA franchise or two – the blogs were alive with arguments why THOSE fans should be penalized while the NBA artificially props up a 14 year failing business venture. The famous “there is no crying in baseball” A League of Their Own woman’s professional baseball is gone. Where there is no demand, there will be no product unless it taps healthy resources. We see darkly that perhaps the 15 years of WNBA losses they’ve sustained are having a negative effect since the NBA has to float ideas of closing ‘stores’ in a HEALTHY league. When we were moving from a transportation system based on horses to one based on automobiles, one could have said of the development of oil and gasoline the very same things you are saying about solar today. Just think of the difficulty of building out a network of fueling stations, product movement systems such as pipelines, trucks, barrels, and the like, and think of the advantages of incumbent technologies. No private business could possibly have undertaken such investment and risk without subsidy. Right? I’d ask you to think about when the last time you left your driveway with your car and had to worry about finding a gas station somewhere along the way to your next destination. Unlike some conservatives I am not against ANY Federal funding of worthy scientific endeavors. Going to the moon had a strategic economic impact on bankrupting the Soviet Union and, last I read, the effort created trillions of dollars of economic wealth from it’s discoveries. I also am advocating to treat the taxpayers as investors for anything outside the realm of National Defense. LOAN GUARANTEES – As mentioned before, Solyndra would NOT have been ‘guaranteed’ if run through the normal channels of the Department of Energy. It is unfair to use this example as a failure of government funding. Especially when there are so many other, better examples. You don’t HAVE to incentivize people to meet a need and take risk. Investors who do that 24 hours a day, are the experts. They look for payoffs and manageable risks. Why would anyone need to convince them to take manageable risk to do something which is their profession? A bias against clean money? C’mon. Some would argue that this was to overcome “racism.” Problem is, there are MANY more white people who are poor who couldn’t qualify for loans too! And it’s funny that the big bad white capitalist had no problem opening McDonald’s or Sears or anything else in those neighborhoods. It was a ruse all along to pad the pockets of congressmen who either wanted and got their own sweetheart deals (like Countrywide), or who intentionally were trying to ‘buy’ votes of their constituents with other people’s (tax payers) money. If a congressperson votes to “lend” or guarantee a project – it is my proposal that they have to put up 10% of their salary for every vote. TAX BREAKS – It will break the heart of many a conservative PolitiJim fans (both of them) to know that I am NOT against tax breaks for corporations at all. As long as there is a direct financial benefit to the government who is giving it, I say GO AHEAD. At a state level, Rick Perry is getting beat up for “crony capitalism” and it may be deserved in some cases. But I defy anyone to tell me how it is not in the best interest of the State of Texas to waive the first $20 million in taxes for a relocating company, or build a road to their new property when you are attracting Facebook, eBay, Toyota or Caterpillar. Not only is that state competing with other states (Arizona, Florida for 2 of those situations), in one case, the economic competitor was China. And I’m NOT talking about giving money away to have a nice PR win. Funny, many conservatives claim to want to reduce corporate taxes AS A WHOLE but will attack the concept Perry has used in Texas or Jindahl has used in Louisiana. If a company was bringing 1,000 employees in state, whose corporate, individual and residual – DIRECT tax revenue would be $100 Million – but Arizona offers to make that $90 Million – are you telling me it is a BAD move to compete with that state by still getting a net of $80 Million you would not have had? Of course not. The reason EVERY conservative economist is in love with at least one of the “9’s” in Herman Cain’s plan, is that reducing the corporate rate to 9% (lowest in the Western World) would create a huge influx of business. Ireland turned a reputation as a drunken social services black hole into the hottest place to do business in Europe. As long as the economics of the company are viable; there isn’t ongoing tax payer risk at stake; the competition is open, free and fair; and it isn’t creating an undue competitive advantage over others in that governed area – I am for it. While there is absolute evidence of corruption regarding Solyndra, the IDEA of solar is NOT a “waste” of money compared to oil, natural gas or coal. Solar and other renewables are getting much closer to non-subsidized viability – but private sector R&D is already better positioned to evaluate the possible winners and losers. If political regulations (like not drilling in Alaska and offshore) were lifted – most likely ALL energy costs would drop – making the need for renewables LESS important here. The US Solar industry IS an exporter of US goods and should be given the same advantages to economically exploit that, without having to subsidize an entire industry’s existence. The crazy idea that we are spending TWICE the tax payer money on 5% of our energy production proves the government has no moral or intellectual capacity to invest our tax payer money. When we NEED cheaper energy and bureaucratic regulation is keeping costs artificially high – Congress should pledge their own salary to guarantee any loans in this arena. PolitiJim hates the WNBA but loves the Bulls.